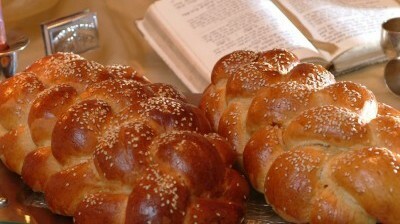 Passover’s over, and we’re all looking forward to eating Challah this Shabbos. This raises a question: Why does chometz—leavened grain such as bread—become permissible to eat after Passover? eating unleavened matzah during Passover heals us. After this healing intensive, we’re able to once again spiritually digest leavened grains. During the process of digestion, we assimilate the useful matter in our food and transform it. It literally becomes a part of us, in the form of blood cells, bone, and fat. Through the acts of chewing, swallowing, and so on, we engage in a kind of unconscious alchemy. After we digest our food we also utilize the energy (calories) in the food. We need this energy to do good deeds and mitzvos, such as smiling at someone, speaking words of encouragement, and praying. When we do *mitzvos with this energy we are using the material to fuel the spiritual. The holy Zohar teaches that every species in the vegetable kingdom has its own overseeing angel. The grape is under the supervision and guardianship of the grape angel. The potato’s under the potato angel. And so on. But grain is under the direct supervision of Hashem. There is no angelic intermediary.